Scientists at the University of California San Diego School of Medicine and Moores Cancer Center have published new evidence for RNA-based biomarkers that can distinguish between normal, aging hematopoietic stem cells and leukemic stem cells associated with secondary acute myeloid leukemia (sAML). The new study—“RNA Splicing Modulation Selectively Impairs Leukemia Stem Cell Maintenance in Secondary Human AML”—published recently in Cell Stem Cell, suggests a new method for predicting leukemic relapse, which manifests as problematic complications and typically afflicts older patients who have often already experienced a bout with cancer. Secondary AML characteristically follows a chronic pre-malignant disease or treatment for other cancers. Consequently, patients tend to be diagnosed later in life, usually in their sixth decade. 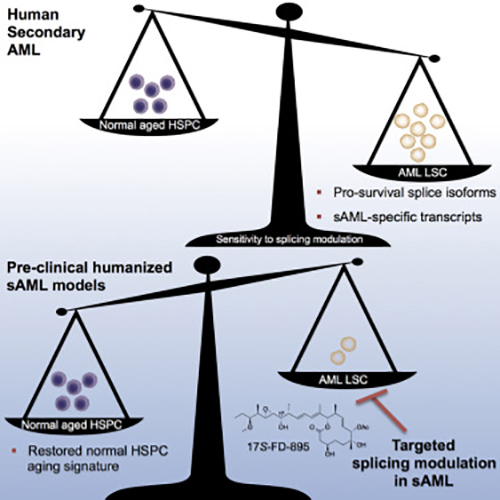 Aging is a primary risk factor for sAML since over time hematopoietic stem cells are inclined to accumulate DNA mutations affecting downstream action molecules such as RNA and proteins. In the current analysis, the investigators sought to understand how RNA might change with the aging of healthy blood stem cells in comparison to sAML stem cells. “By being able to distinguish benign from malignant aging based on distinctive RNA splicing patterns, we can develop therapeutic strategies that selectively target leukemia stem cells while sparing normal hematopoietic stem cells,” Dr. Jamieson noted. With the aid of next-generation sequencing technology, the research team was able to identify unique RNA splicing variants that could distinguish normal, aging stem cells from abnormal, malignant ones. “These splicing signatures could potentially be used as clinical biomarkers to detect blood stem cells that show signs of early aging or leukemia, and to monitor patient responses to treatment,” said Dr. Crews. With the RNA biomarkers identified, the scientists looked to see if small molecule splicing modulator compounds could inhibit stem cell activity for sAML. Using patient-derived animal models, the researchers found that just three doses of a naturally derived compound, called 17S-FD-895, was able to significantly reduce the ability of leukemia stem cells to self-renew. The investigators noted that RNA splicing-targeted agents had been shown to have positive activity in a variety of solid tumors—suggesting that their new findings may be relevant to a variety of cancers, such as breast and drug-resistant melanoma.